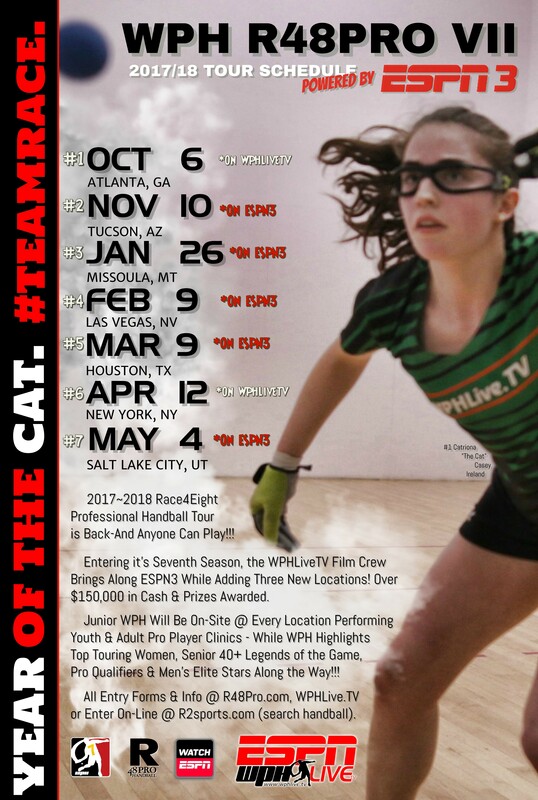 The seventh season of the WPH Race4Eight Professional Handball Tour makes stop #6 the last regular stop before the big Player’s Championship in Salt Lake City, Utah, a month later–And You’re Invited! WPH Pro Qualifier will begin Thursday after noon (possibly continuing Friday morning & will be capped at 32 total players); some local brackets will also kick off at noon on Friday; meanwhile women’s round of 16 matches will start Friday Morning (Rd of 8 Friday evening). WPH main bracket men will begin after 11am on Friday. WPH will air professional handball on www.wphlive.tv (not to air on ESPN) beginning Saturday Morning. The NYAC Annual Invitational Handball Tournament is a fan favorite. Stay right at the NYAC and enjoy the most scenic family handball event on tour! Entry fee entitles each player to daily hospitality starting Thursday and Saturday night dinner @ TBD Location. Attire: Men: compulsory jacket on Thursday/ Friday and Saturday dinner (if at the AC) – Collared shirt: weekends starting 5pm Friday. Proper attire is a NYAC requirement. Lodging: A limited number of rooms are available at the athlete’s rate at the NYAC. Room Reservations: (212)767-7121 – ask for Jacqueline Bonet. WPH will film and broadcast these games at www.race4eight.com or you can watch court side. Contact us for details info@wphlive.tv.